Simple mindfulness practices to help your child (ages 5-12) deal with anxiety, improve concentration, and handle difficult emotions. Includes a 60-minute audio CD of guided exercises read by Myla Kabat-Zinn. Mindfulness--the quality of attention that combines full awareness with acceptance of each moment, just as it is--is gaining broad acceptance among mental health professionals as an adjunct to treatment. This little book is a very appealing introduction to mindfulness meditation for children and their parents. In a simple and accessible way, it describes what mindfulness is and how mindfulness-based practices can help children calm down, become more focused, fall asleep more easily, alleviate worry, manage anger, and generally become more patient and aware. The book contains eleven practices that focus on just these scenarios, along with short examples and anecdotes throughout. Included with purchase is an audio CD with guided meditations, voiced by Myla Kabat-Zinn, who along with her husband, Jon Kabat-Zinn, popularized mindfulness-based stress reduction (MBSR) as a therapeutic approach. "Sitting Still Like a Frog introduces the basics of mindfulness to children in an easy-to-understand and playful way. It guides children in the cultivation of presence: presence of mind, presence of heart, and presence in the body. This is something we are all capable of but usually don't cultivate intentionally. Why not start young in training those capacities? The world nowadays is so complex and fast-paced that knowing how to ground oneself in the present moment is an absolute necessity to make sense of the world and to continue learning, growing, and contributing what is uniquely yours to contribute in this world." --from the foreword by Jon Kabat-Zinn "Sitting Still Like a Frog teaches children mindfulness through an amphibious friend who sits very still. . . . Many practices fill the book and audio CD, and all of them remind us, and our children, just how easily thoughts can move us off our lily pads." 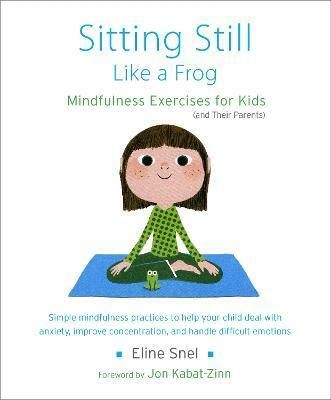 --Mindful magazine "From the central image of sitting still like a frog to the spaghetti test for physical relaxation, the images, metaphors, and practical exercises are pitched at the right level to really engage children--this book and CD will prove a valuable resource for our family's spiritual explorations." --Juno magazine "An informative Foreword by Jon Kabat-Zinn introduces this valuable guide on mindfulness and meditation for children. Eline Snel is a seasoned parent, therapist and teacher. Her book is filled with practical suggestions and examples of how mindfulness can help to cultivate attentiveness (internal and external), relieve stress, recognize moods, relax, and deal with what is happening within and around us. The CD provides eleven guided meditations. For parents, teachers and anyone ages 5 to 12 (and up)." ELINE SNEL is a therapist and certified MBSR trainer and runs the Academy for Mindful Teaching in the Netherlands. She has been developing and teaching mindfulness-based courses for over twenty years and trains teachers to teach MBSR techniques to students. Her program has been used in numerous primary schools in the Netherlands. She has recently started a pilot project in various secondary schools to teach mindfulness practices to teenagers. Eline also teaches the program in Belgium, France, and Germany. More information is available on www.academievoormindfulteaching.nl and www.elinesnel.nl. For children's training by AMT instructors, see www.aandachtwerkt.com.